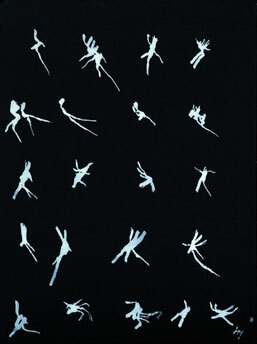 The National Museum of Modern Art, Tokyo exhibits Henri Michaux’s lyrical abstractions. Henri Michaux began as a poet and later increasingly found painting a more satisfying medium to express things beyond the scope of the written word. He is perhaps more notorious for his experiments with the drug mescaline and has often been cited as an influence on the beat poets and the sixties creative scene. Focusing on the development of his distinctive paintings spanning over 40 years, this show is a great introduction to his style or alternatively a great opportunity for people to re-discover his willfully unique work. Loosely organized by media (frottage, Indian ink, watercolor and oil) the exhibition contrasts the different styles and examines his struggle to free the image from the constraints of representation. His own painterly work changed direction drastically while he was living in Paris, where he discovered abstraction. His later travels and exposure to a range of South Asian countries, including China and Japan, continued to influence his developing style as he worked mainly in Indian Ink, later experimenting with color as seen in the acrylics of the 1980s. Whereas other ‘abstract artists’ such as Pollock aimed to capture the impersonal nature of movement or identity within a painted line, Michaux’s work show the line being used as an extension of interior bodily sensations. His works reveal an almost physical struggle between the desire for abstraction and the desire for form, as a line morphs into a figure or twists to form language-like marks. As you walk from the first room to the second, the connection between mark and movement becomes more apparent: the drawings are arranged almost like stanzas in a musical score. The mescaline drawings are a layering of fragile lines, delicate and disturbing: there seems to be a unifying pattern or a struggle for something to emerge, as though something is being communicated in a language that is impossible to decipher. Looked at in the 21st century context it is easy to make comparisons to brain activity graphs or other literal interpretations but what is most engaging about the images is the balance of texture and form. In the aptly named ‘Movements’ series a hint of a body or face will emerge from within a rhythmic shape. Michaux’s mark-making not only captures a sense of transition and change within the static surface but within the very lines themselves. The sense of there being a creator remains but what emerges through the images is the trace of a state rather than any concrete impression of personal intent. The gaps and fissures of the images speak, as do the silences or repetitions or words. 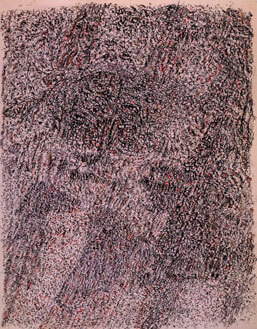 Michaux’s art is not one of neutrality but of one of struggle and decomposition.